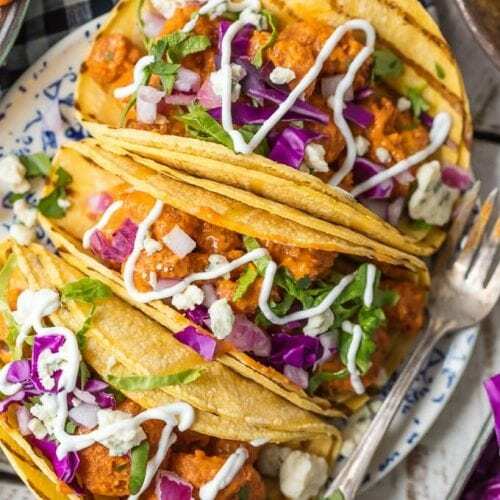 This BUFFALO SHRIMP TACOS RECIPE is tossed in a finger licking good creamy buffalo sauce and easier than you can even imagine. Perfect for Cinco De Mayo, Lent Friday meals, family night in, or game night with friends! Nothing is better than spicy crispy popcorn shrimp topped with all the fixings and wrapped in a corn tortilla. I’m obsessed. Creamy Buffalo Shrimp Tacos are my new weekly craving. Buffalo Shrimp Tacos. Can you blame me? This Shrimp Taco recipe is second to none and so sneaky easy. The secret? POPCORN SHRIMP! Toss those babies in the ultimate buffalo sauce and call it a day. Divine, I tell you! When it comes to easy recipes, I want to be your spirit guide. It’s my mission to make finding your way around a kitchen and impression one and all something you not only can do on the regular but also feel GREAT about. I avoided cooking for far too long but now that I’ve realized how simple it can be, I can’t stop won’t stop. These Buffalo Shrimp Tacos are the perfect example that cooking can be EASY and DELICIOUS. 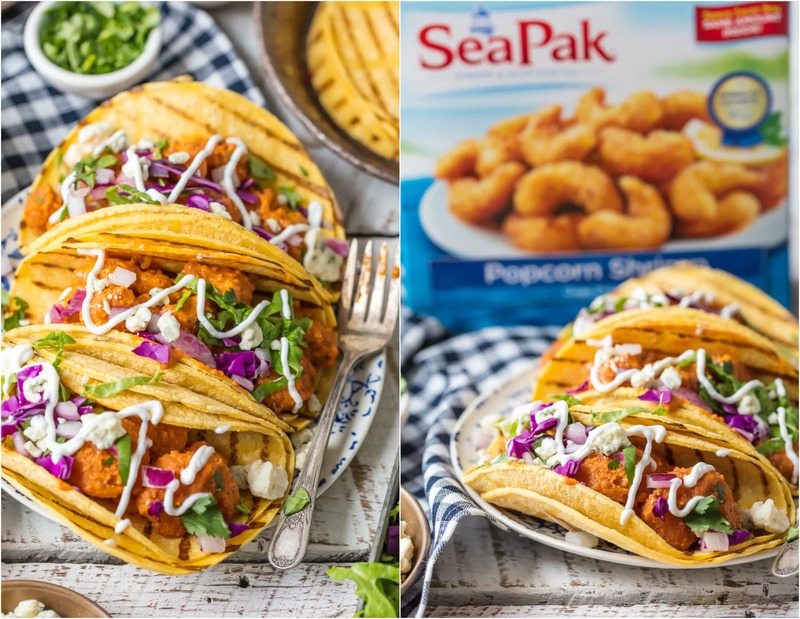 The secret to success with these Buffalo Popcorn Shrimp Tacos is just that…the popcorn shrimp! I have to be totally honest…handling raw shrimp isn’t my favorite thing in this world. That being said…I LOVE cooked shrimp and even more than that…Pat is OBSESSED! When he saw the freezer stocked with SeaPak Popcorn Shrimp he practically walked behind me every step of the way while I made these tacos. He’s a huge fan. SeaPak makes it easy to own the kitchen, and that makes me love them even more. I love all the possibilites with their popcorn shrimp. You won’t believe how they crisp up in the oven. SO CRUNCHY and delish. 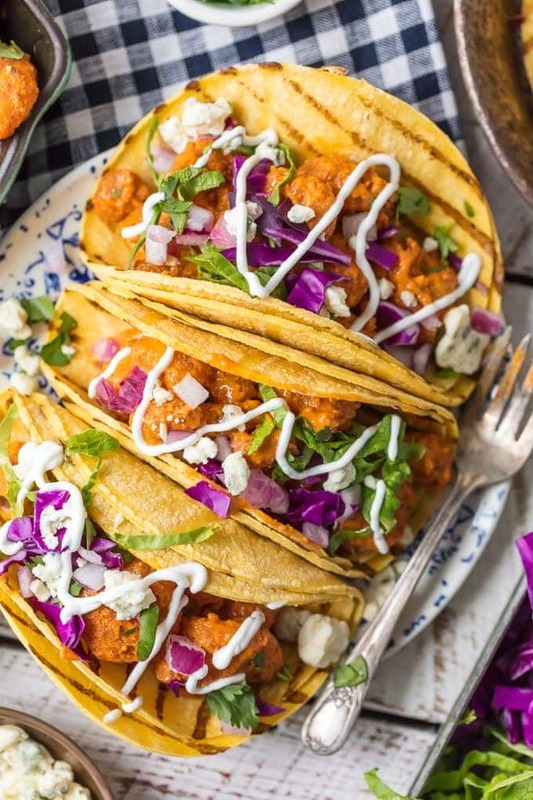 We love them on their own, tossed into salads or grilled onto flatbread, but especially in these Creamy Buffalo Shrimp Tacos! I cannot wait for you to try these. You can find out where they’re sold near you HERE. What’s a good side dish for Shrimp Tacos? SO MANY THINGS! Give me all the cilantro rice, black beans, tortilla chips, Mexican style slaw, and so much more! Get creative and trust your gut. You’ve got this! Are Buffalo Shrimp Tacos healthy? Yes and no. The popcorn shrimp are only 230 calories for 14 shrimp. I only used about 7 per taco. Of course they’re tossed in a buttery and creamy buffalo sauce so…there’s that. But you can make these as decadent or healthy as you choose! All the toppings are light and fresh. Everything in moderation. I love all the colors and flavors. Do you like ranch or blue cheese with your buffalo shrimp? GOOD NEWS, I used BOTH! There’s ranch dressing in the creamy buffalo sauce and the tacos are topped with crumbled blue cheese. I like to live with the best of both worlds. No shame in my game! Make these Buffalo Shrimp Tacos for Taco Night! Check out the full Taco Tuesday Guide for more tips, ideas, and recipes. What are you waiting for? This Buffalo Shrimp Taco Recipe is ready and waiting! I hope you love it as much as we do. Be sure to check out SeaPak at your local grocer! Or follow all their amazing products on Facebook, Pinterest, or Instagram. Sign up for their newsletter (comes with coupons!) HERE. 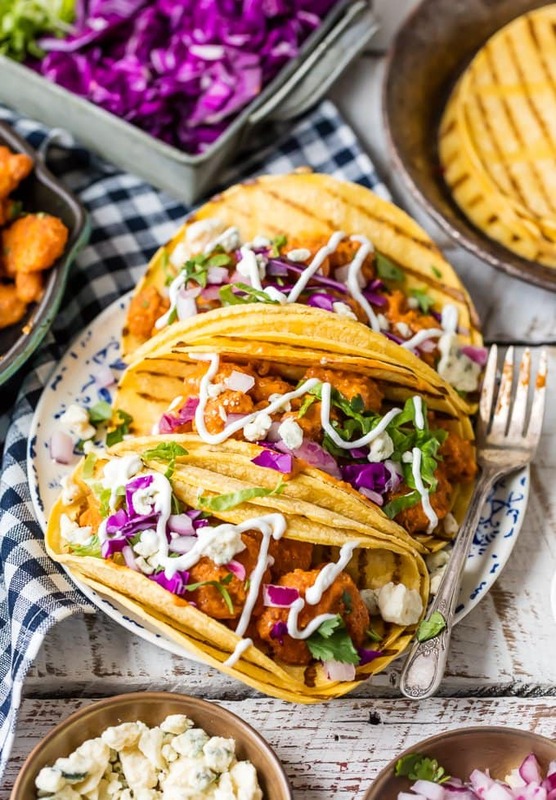 Check out some of our other favorite taco recipes like Baked Chicken Tacos, Breakfast Tacos, and Slow Cooker BBQ Chicken Tacos. If it’s shrimp recipes you crave, be sure to look at our Bang Bang Shrimp, Cilantro Lime Shrimp, or Chipotle Shrimp. You can check out all of our favorite lunch and dinner recipes to find something perfect for your family TONIGHT! We are here to make feeding your family easy, and of course delicious. See the recipe card below for full details on How to Make Popcorn Shrimp Tacos. Enjoy! 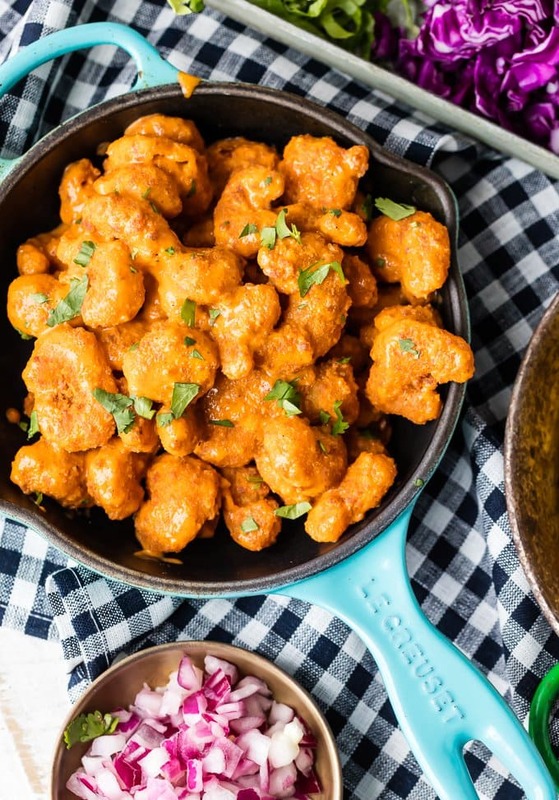 This BUFFALO SHRIMP TACOS RECIPE is tossed in a finger licking good creamy buffalo sauce and easier than you can even imagine. Perfect for Cinco De Mayo, Lent Friday meals, family night in, or game night with friends! Nothing is better than spicy crispy popcorn shrimp topped with all the fixings and wrapped in a corn tortilla. I'm obsessed. 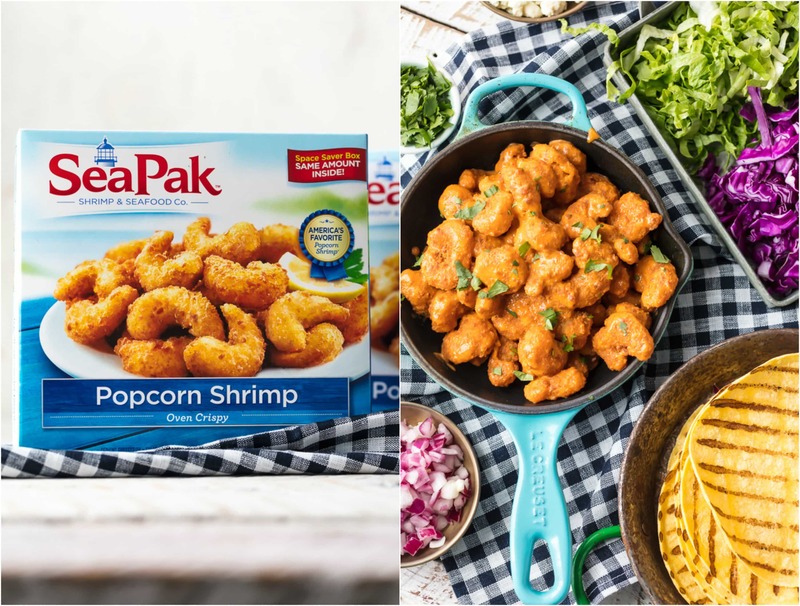 Spread popcorn shrimp in a single layer on a baking sheet. Bake according to package instructions, turning once during cooking. As shrimp cooks, heat butter, buffalo sauce, and ranch in a medium sauce pan. Heat on medium heat until everything is melted together, stirring occasionally. Reduce to a simmer until shrimp has finished cooking. When shrimp is done, turn heat off sauce and toss shrimp into the saucepan. Use a wooden spoon to fully coat all the shrimp in the sauce. Assemble your tacos by laying approximately 7 shrimp on each corn tortilla and then top with a sprinkle of cabbage, cilantro, lettuce, onion, and blue cheese. Finish with a drizzle of sour cream. 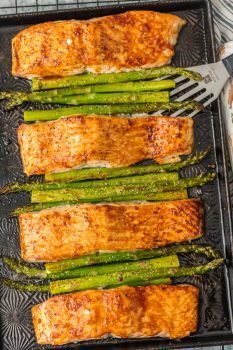 what a great easy dinner idea! i imagine my boyfriend would be pretty excited if i made something like this as well. hell, i could put chicken NUGGETS in a taco and he’d be impressed – lol! 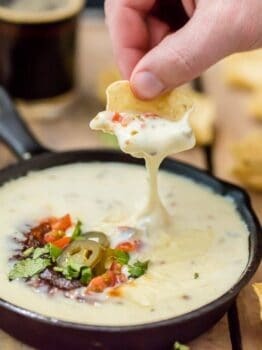 love this recipe, eSPECIALLY that CREAMY buffalo sauce!